Winter Melts Into Spring With Headdresses and Hair Accessories Tonight! Though some in the country are still facing winter storms, on the west coast we already have spring blooms and warm days. 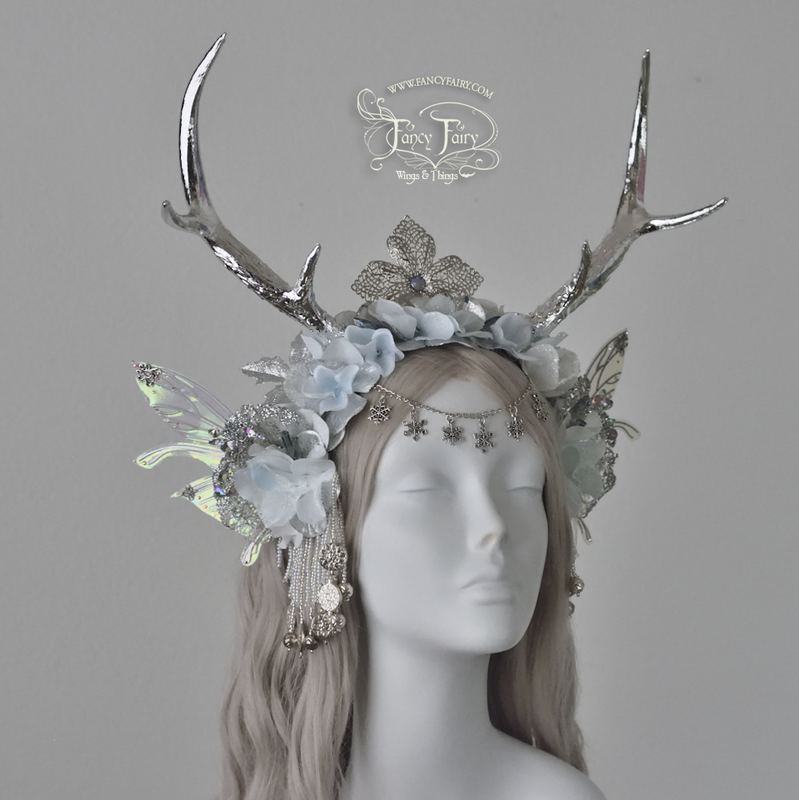 The 7 winged headdresses and hair clips listing tonight at 8pm reflect both seasons as one melts into the other. 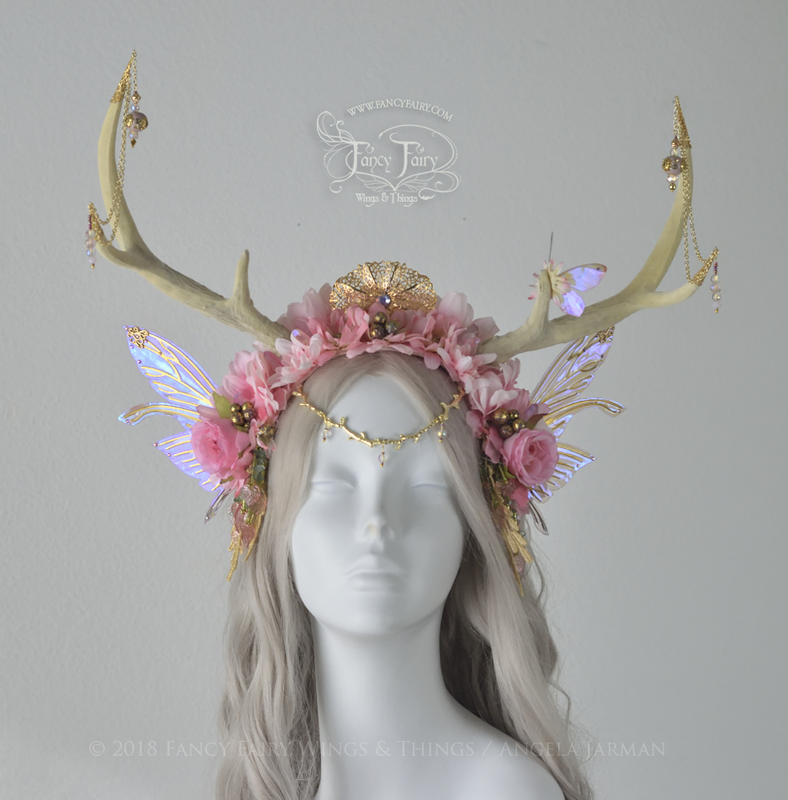 The first was the most intense to create, the Pink Blossomed Fairy Faun antler headdress. 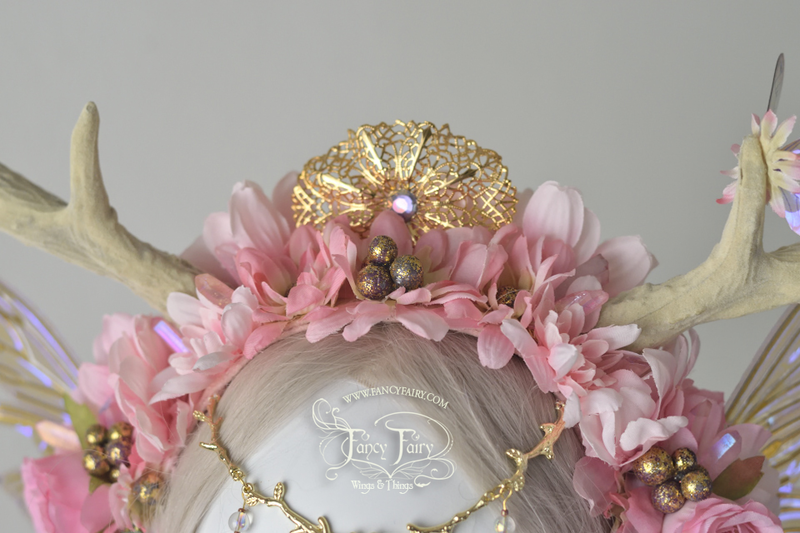 Lots of details such as gold / brass filigree in the center and at the horn tips, from which jeweled bead strands hang. 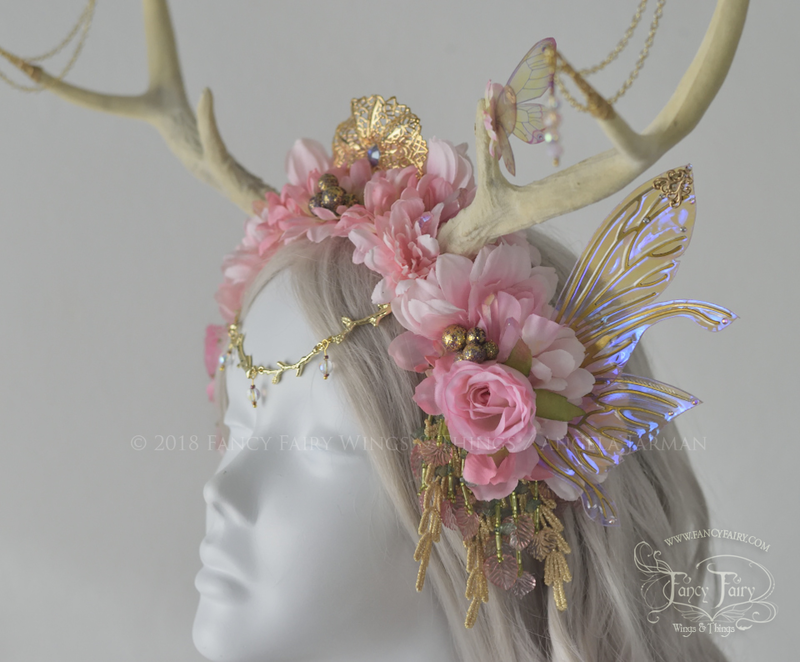 Pink quartz crystals are hidden in the blossoms, and Swarovski crystals decorate the Salome wings on either side, which are made with actual metal frames! 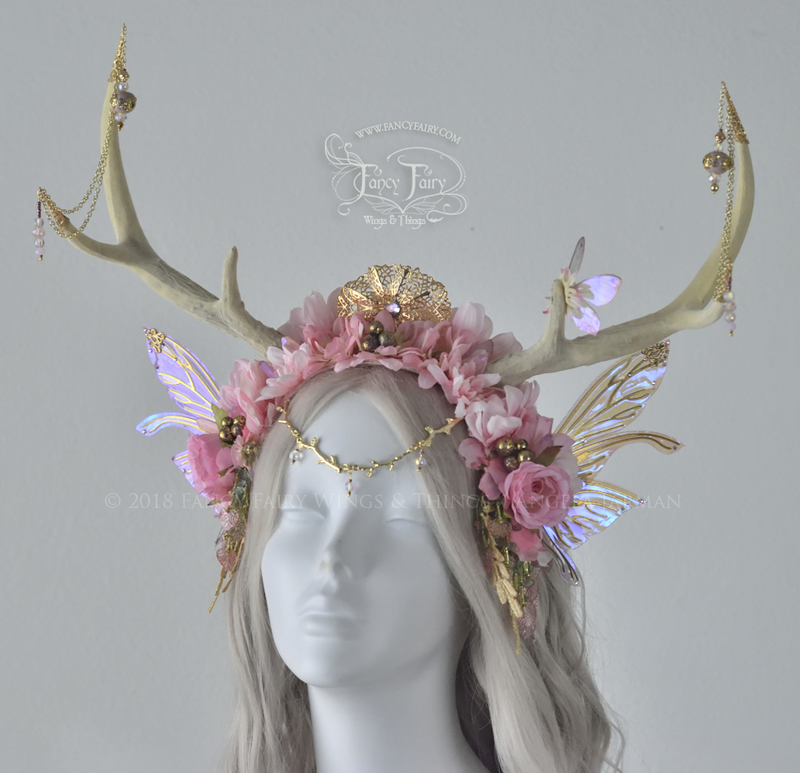 In fact all the pieces tonight except the Valentine headdress use wings that are mini versions of my original wing designs. It attaches via an adjustable elastic band that goes under the back of the head, which is removable, and also comes with clips at each side hidden underneath for extra security. You might be able to get away with wearing it without the elastic, but probably only for photos if you keep your head verrry still. 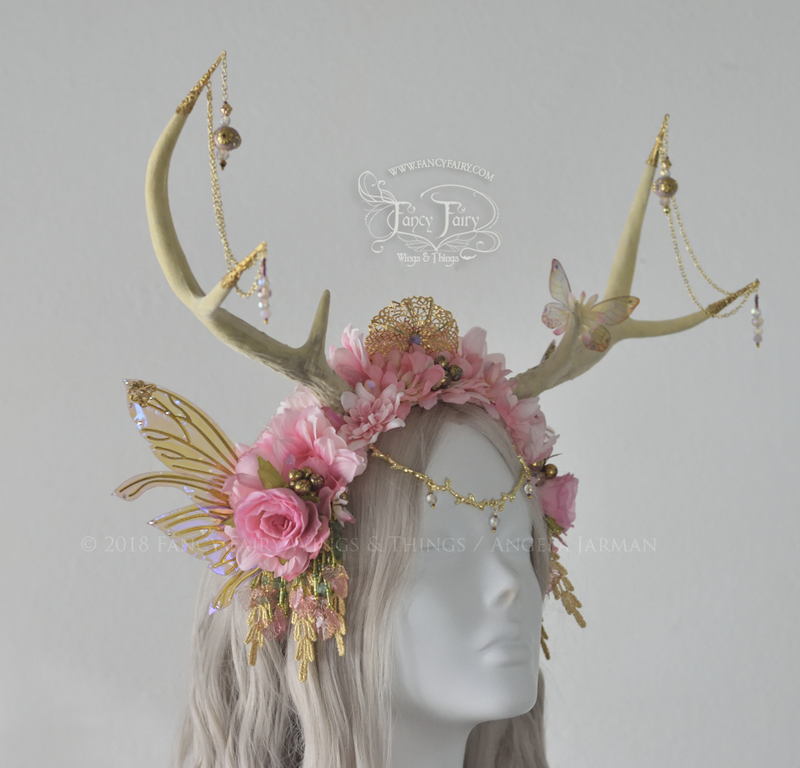 The other 3 headdresses fanciest attach this way as well. The price of this one will be $359 plus shipping. 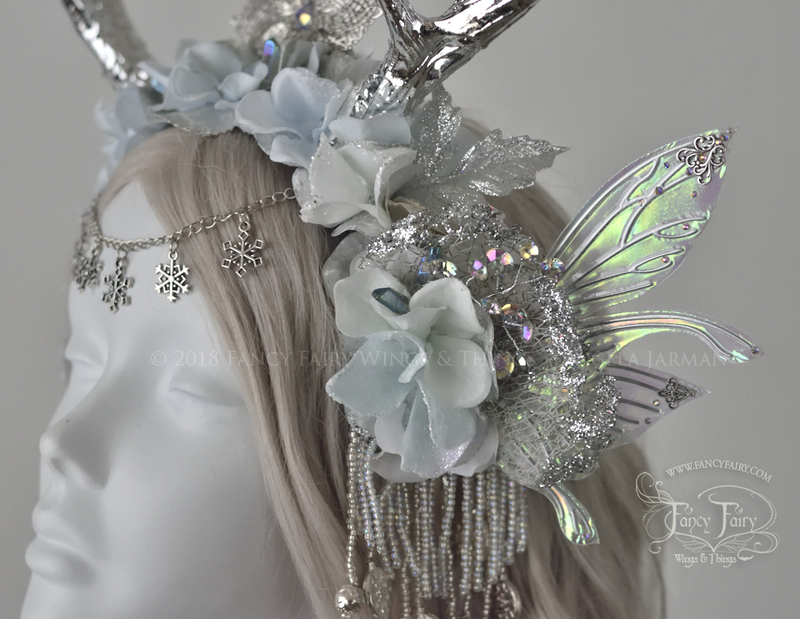 The second headdress also sports antlers, but this one is done in a winter theme with silver, icey blue and white. 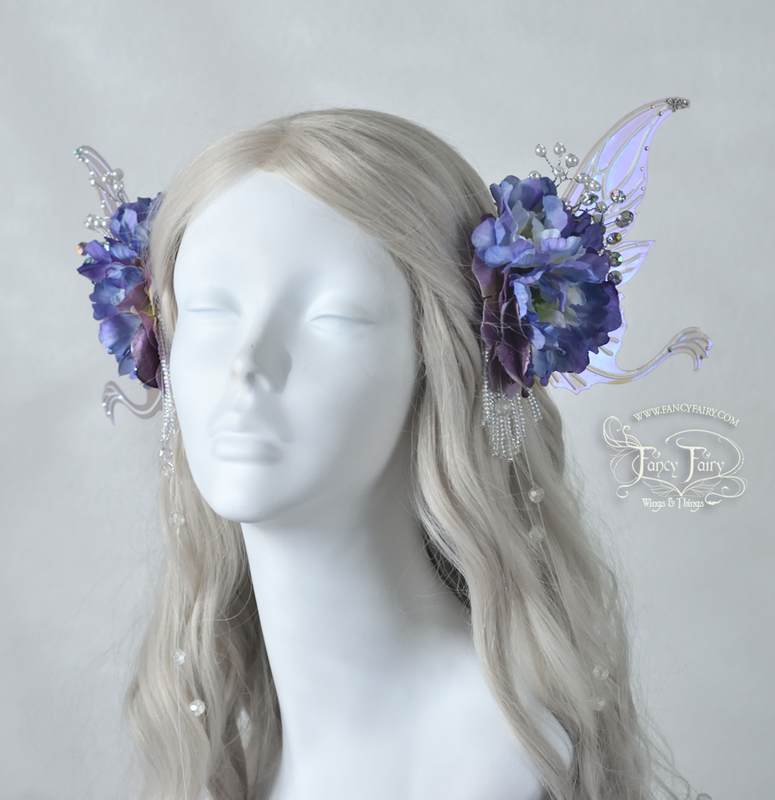 Bluish crystals peek out from the icey flowers and iridescent sprays adorn each side along with the Salome mini wings done in White Satin iridescent with chrome silver veining, silver filigree and Swarovski crystals. This piece will be $325 plus shipping. 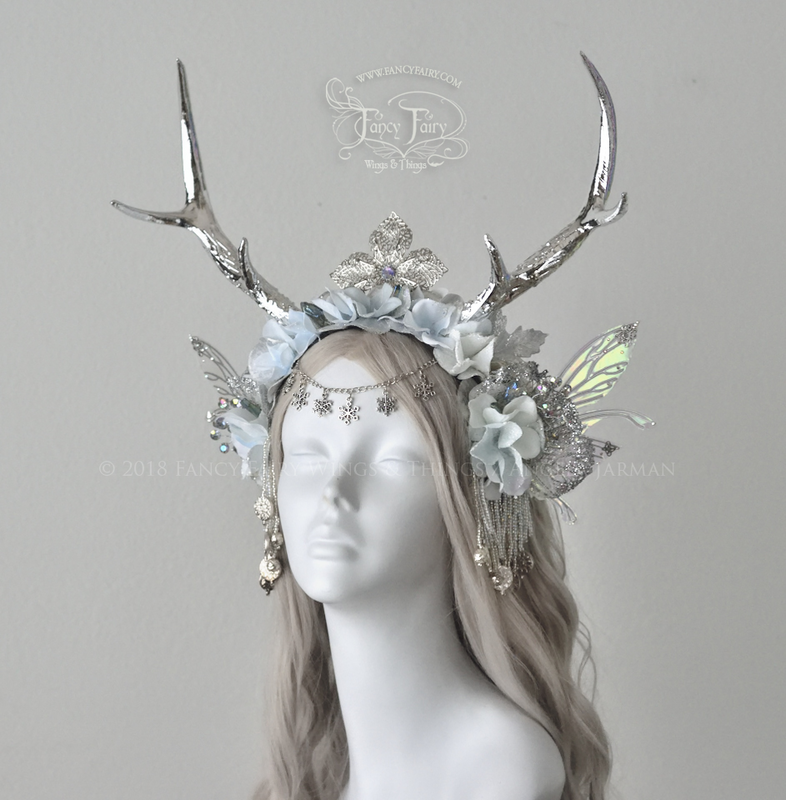 The third piece is another wintery one, but I also think it would work great for a Navi cosplay! Silver lace, and cyan blue iridescent glass beads and silver chain adornments decorate this glittered faux flowered piece, and the mini wings are the Aynia design with Aqua film, white veining, silver filigree and Swarovski crystals. Will be $315 plus shipping. The 4th offering is also wintery, but in the form of clips that attach at either side of the head - and could also be used to clip onto your clothing! The mini wings are the Salome design, done in Aqua film with pearl veining and decorated with silver filigree and Swarovski crystals along with iridescent jeweled wire sprays and iridescent white beaded fringe. Will be $165. I will also have some rare made to order wings, which you will also be able to mix & match so you can choose which bottom panel you want with it! Remember to get there right on time at 8pm Pacific Standard Time, click through to the Shopify store.